Afan Valley Adventure Resort is set to become a leisure destination covering approximately 450 acres of a former forest in South Wales. The Treetops Hotel and Spa is set in the heart of Afan Valley Adventure Resort, bringing 100 luxurious suites across two floors. 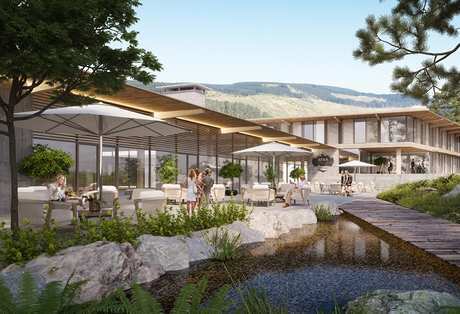 The 5* hotel has been carefully designed with high quality furnishings and fixtures internally, alongside blending externally into the natural and dramatic landscape surrounding the hotel. In 2017 Wales was named the fourth best region to visit by acclaimed travel guide Lonely Planet. Key to the appeal of Wales is the regions countryside and landscape, alongside its many heritage sites, with sightseeing, castles, historic attractions, beaches and museums being the top five activities among tourists. Tourism is one of Wales’ biggest and most important industries, with visitors spending on average £5.5 billion per year. Between January and September 2017, a staggering 7.3 million overnight trips were made to Wales, with an average spend of £1.4 million. If you would like more information Treetops Hotel and Spa or further information on our portfolio of hotel investments, call 0161 464 7530 or email us on enquiries@hopwoodhouse.com.